Hi there -- I'm Odetta (named after the singer and activist) and this is my friend Otter. 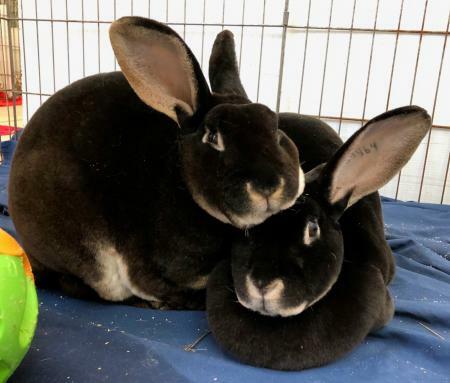 We're both otter rex rabbits, and people here say we're just about the softest rabbits they've ever felt in their lives. I don't know about that but I know we're bunnies in love. When we first arrive here at SaveABunny, we were quite nervous but we've settled down since because it's really nice to have met some rabbit-friendly humans. So now we're interested in meeting some more, and maybe you an tell us if we're just the softest creatures in the world?